UGH! OMG!! I am SO FULL!!! it is our Thanksgiving here in Canada today and even though dinner was about 3 hours ago I am still so full. We had a huge turkey dinner with everything you can think of on the side, including my all time fav, stuffing! I still have not had dessert yet because I have not been able to, but pumpkin pie is waiting for me in the fridge. Trust me, as soon as I get a lil bit of room, I will be eating it:) I am so thankful on this day but also everyday for my family and friends that are around with me to enjoy the meal we had and for the fact that I am healthy and lucky enough to enjoy the little things in life, including polish. It's seems so trivial, I know, but for me, it's my hobby and it really does bring me joy and I love taking pictures of what I have done and I am grateful for the few followers I have and so grateful to have found the online nail polish community because I have found so many great friends in the process. 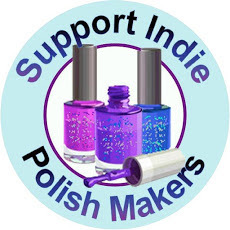 So, my blog is more than a year old and I am just happy that I am able to get my hands on new polishes here and there and to be trading and buying from people online and....well... just... happy. Of course ,I am happy with many other things in my life, but, seeing as this is my nail polish blog, I just wanted to express that. And since things have died down here and I don't want to go to sleep just yet, I have a nice glass of wine at my side and wanted to share something with you guys that I actually have had for a lil bit. One way I get new polishes from time to time is by joining giveaways. 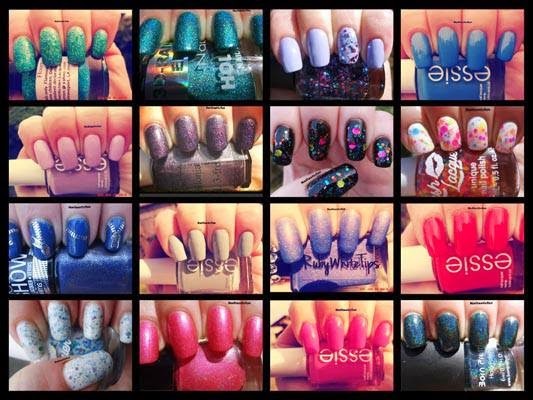 There is always more than a few giveaways going on ( I even have a FB group devoted to just postings of nail and beauty related giveaways. It's a secret group though because we were getting way too many spam bots so if it is something you are interested in joining, ask me about it in the comments or you can find ways to contact me under the "contact me" section) Anyhow, obviously there is no guarantee that you will win any or what not but I do participate in as many as I can and I have actually won a few here and there. The great thing I have found is that when I win, the host or hostess are always more than nice and friendly. 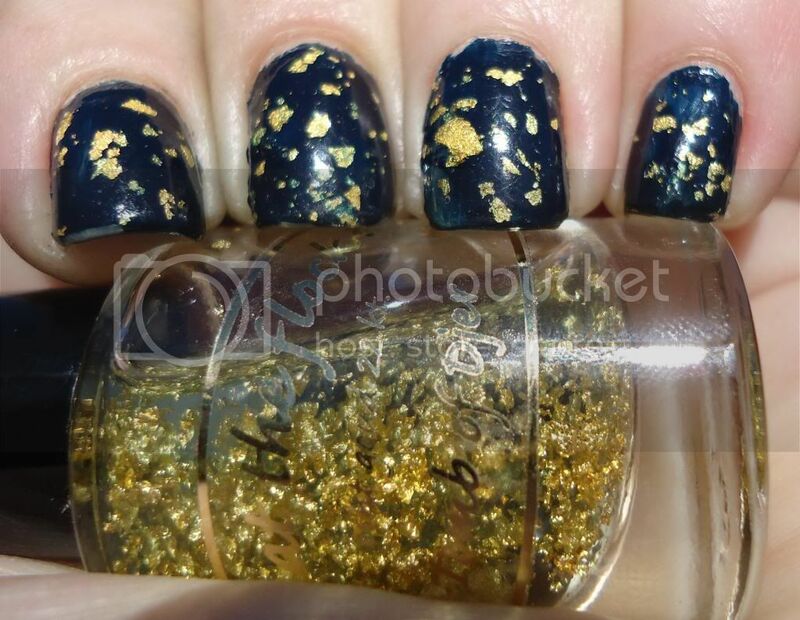 I actually did not win this giveaways main prize but I was one of the secondary winners (or maybe 3rd...4th) which is more than fine by me and I was lucky enough to have won a mini bottle of their gold top coat. 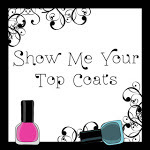 I was so happy to have won this because I do not own ANY of the top coats out there. 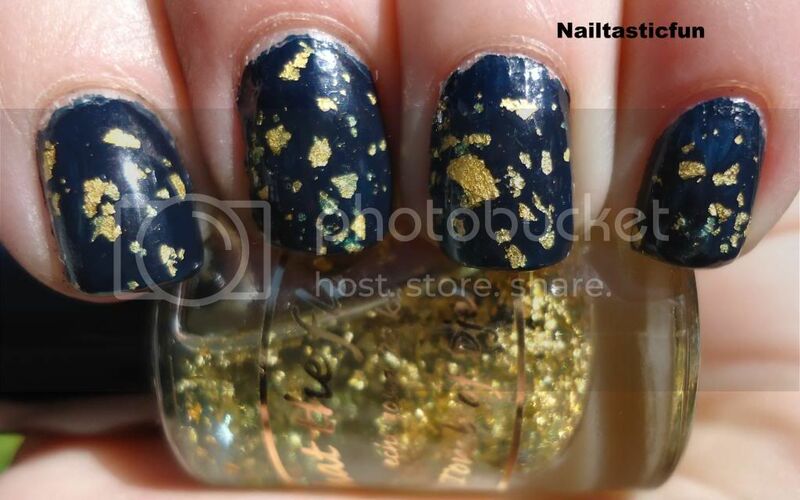 I almost had the Zoya one once but that was a huge drama infested swap that did not turn out that I just won't get into and OPI's "Man with the golden gun" was for sale out here in Canada only at my nail supply store for 35$+tax but I never did go for it.... Now, I see more and more brands coming out with some but still, as I said, did not have one but really wanted to try one so, winning this was just AWESOME! Plus it was a brand I had not yet tried so it was a win win. As always I say a little something about the polish but this is pretty self explanatory so let me guide you to the brand. As I said they are named "What the flock" (AWESOME right?!?!) and is a Dutch company, I believe. Here is a link to their website and here is their facebook page. In emails with me, they spoke English so I don't think communication is a huge problem. 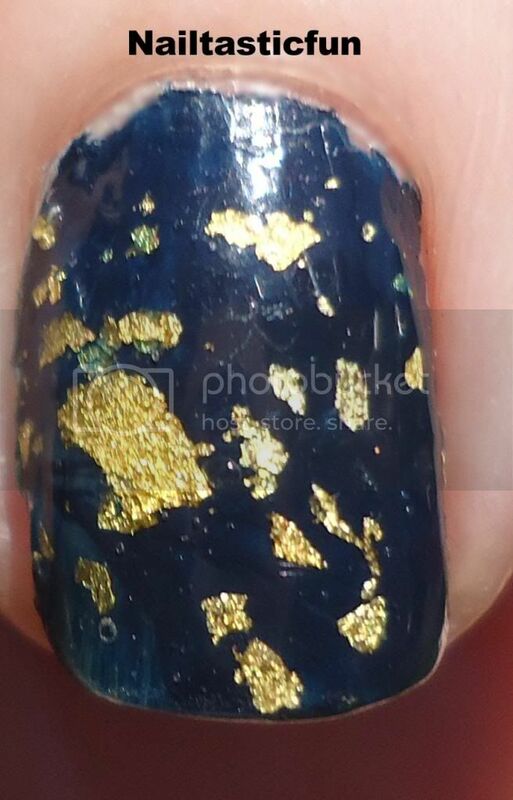 Anyhow as I said, the polish is your basic gold top coat in a clear base. 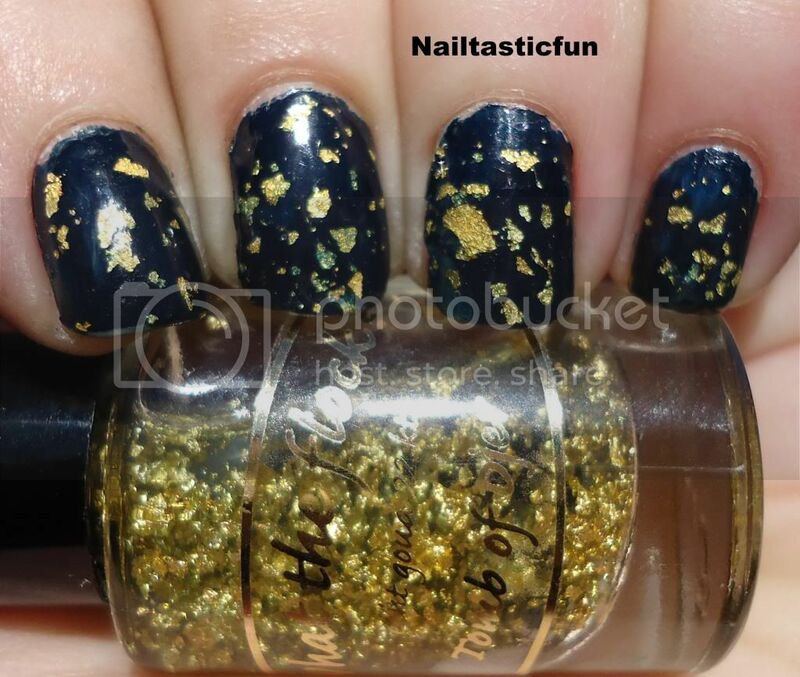 Which, in case you don't know, is actually gold specks in a clear base that you apply to your nails, preferably over a dark color. Let's have a look at what I did with mine. I put it over OPI "incognito in Sausolito" which is a dark, navy creme, perfectly opaque in two coats. I actually have the whole San-Francisco line to swatch for you guys and this was one of my fav of the collection. 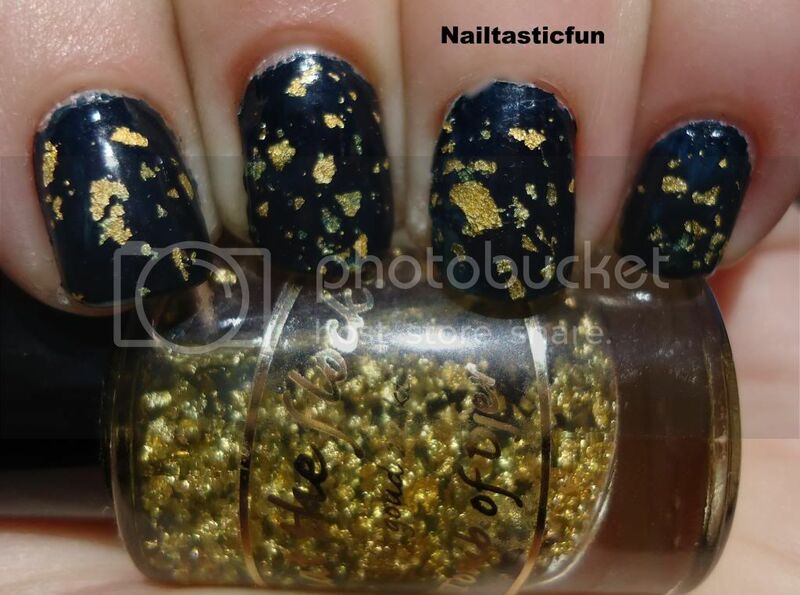 I personally think that the gold top coat looks best over dark colors and I think this was a great choice. Let's get to the pictures and see if you agree? I did have a bit of trouble fishing the gold pieces here in there. I do believe it may have a lot to do with the fact that I had a mini bottle but it was a bit hard to get specks on my brush at times. If you look at the bottle you can see that there is no shortage of gold flecks. If I had gone and got a bigger brush (from any other bottle of normal sized polish) I bet it would have made it much easier. You can see some spots, especially on my middle finger where over the top coat, you see some of the base color on top of it. That has to do with when I had a hard time fishing for pieces, I would get a lot of the clear base coat and it did make a bit of a heavy coat. Again, it looks and sounds much worse that it was. *Products in this post were awarded to me from a giveaway, however all opinions are my own. I was not given the bottle in return for my post abut them. In fact, I do not believe they even knew I had a blog or that I would be doing a post. 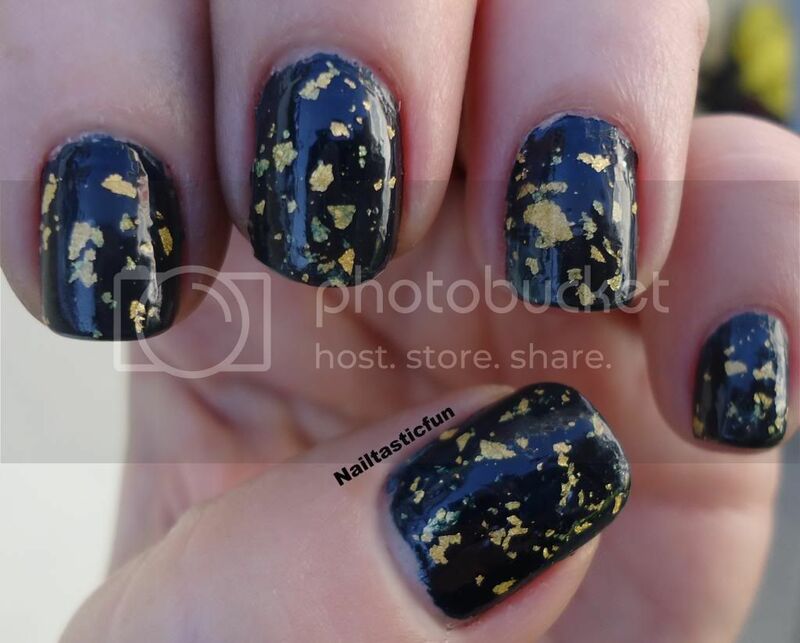 Love the gold on that dark color! Great combo! 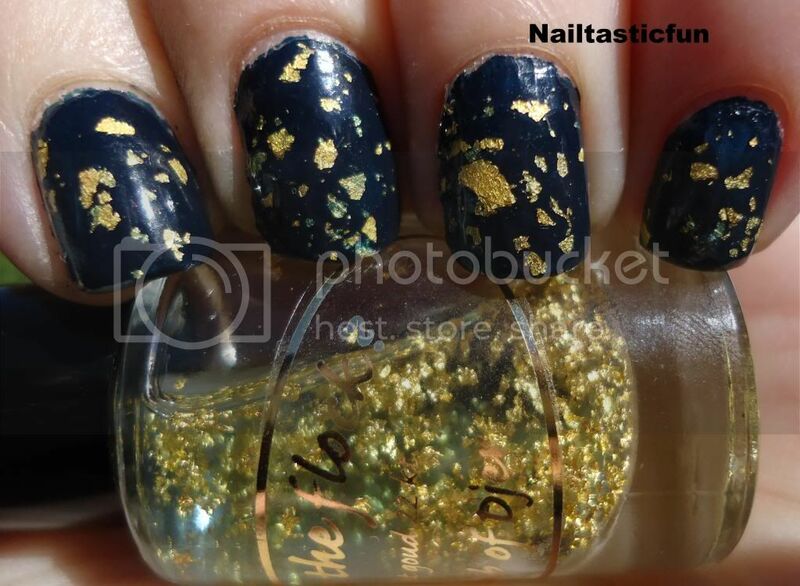 Not sure I would ever wear gold flecks on my nails (I barely wear nail polish at all)-but it certainly does look intriguing. You definitely would have to use that over a dark color for the full effect to be seen. 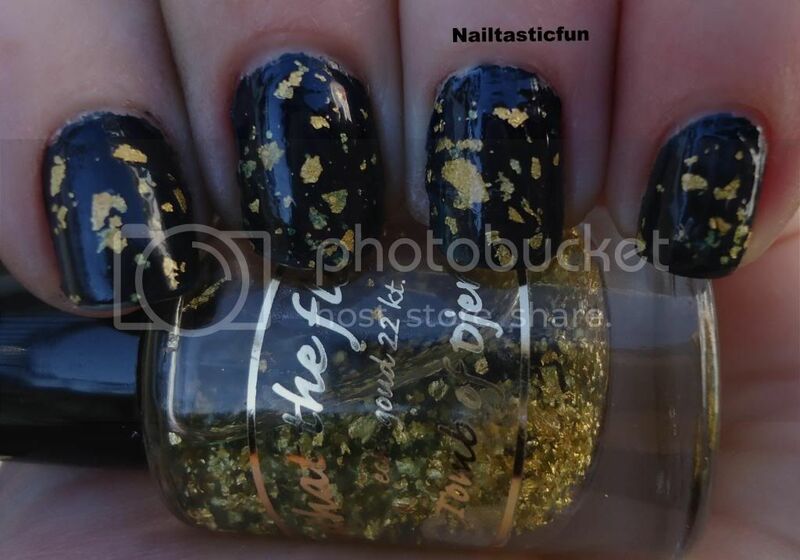 your nails turned out great, but fishing the gold flecks out has got to be a pain. My Granddaughters would like this. Me... I don't paint my nails. I love Thanksgiving dinner, turkey and all the trimmings! 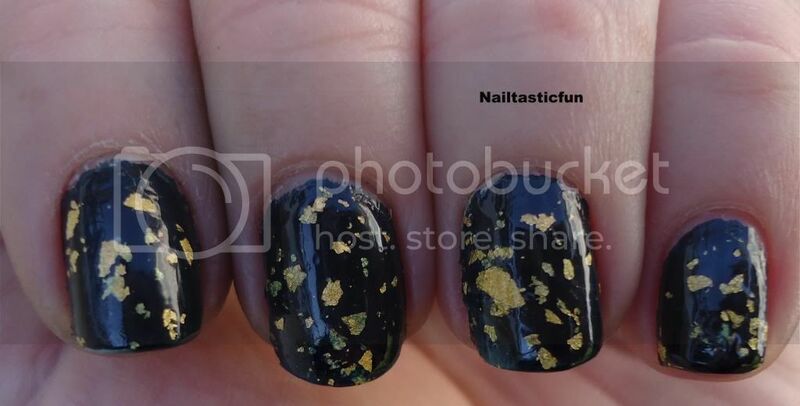 Not really fond of this black and gold polish. I normally like the ones you share but this one is not for me. 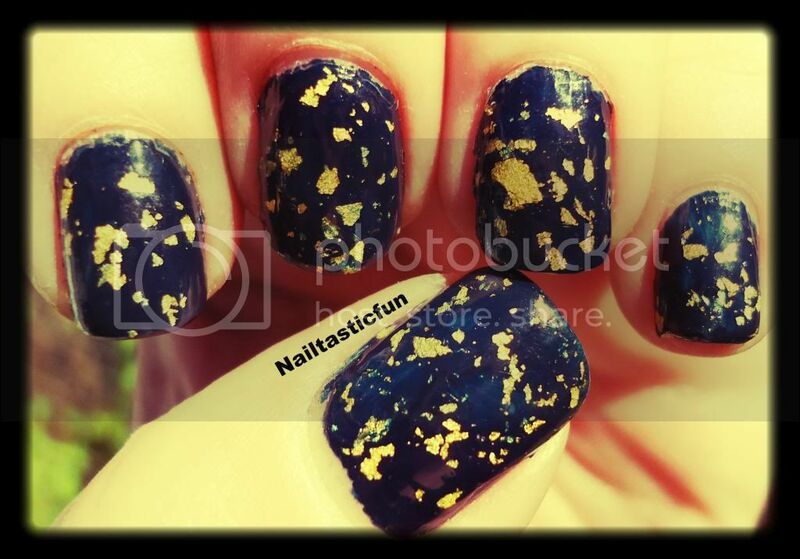 I absolutely love the gold flecks of the nail polish! I'm a big gold fan, so I love this look. Those turned out great. They are perfect for Halloween outfits too! Love this. Oh heck I love all of the designs you have shown. I could spend a fortune because I want all of the polishes!! I love this look. With the dark color and then the shiny gold I think it looks very dressed up. Nice for parties coming up for the holidays. Happy Thanksgiving! Make room for the pie! That is REALLY pretty!! 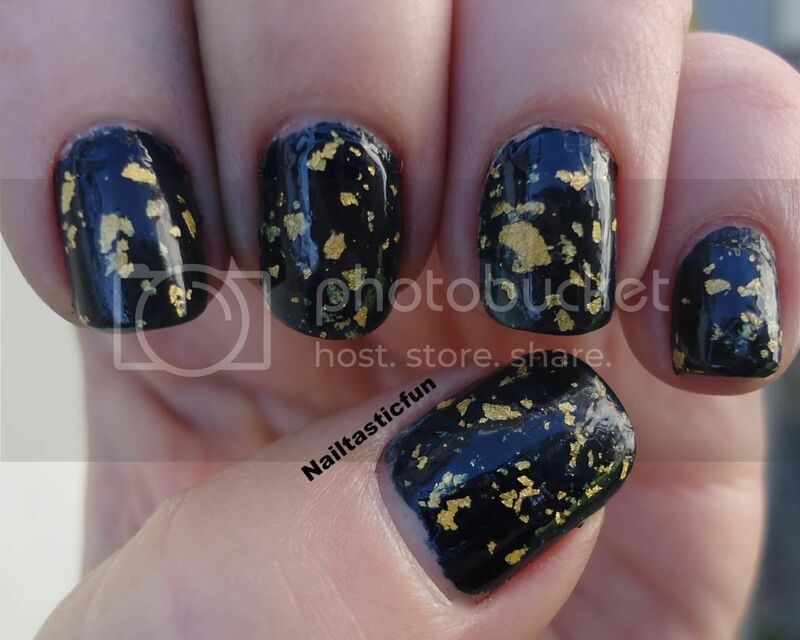 I love the black and gold - wonder if it would work well with like a dark emerald green? Who can resist a brand named "What the Flock"! 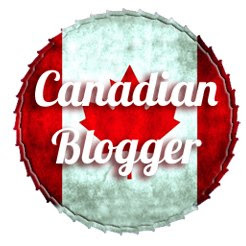 What a cute blog you have! What a pretty color that is! It's very becoming! Oh, pretty! I don't really care for gold, but this isn't too bad! i usually have plain nails but id o like fun ones too (on others). Im so hard on my nails, I dont think they would last My daughter's nails would be perfect for that! I love it over a dark color and as a top coat. I definitely think a dark color works best for it to show. At the moment my nails are short but my daughter would love something like that. I wish I was cool enough to wear something like this! Looks really pretty, I like that you can add it on top of another dark color. I think you are so great in your choices and your nails just awesome! I can't seem to find a nail polish that will actually stay on my nails. It always chips right off. oh my! we have to get our hands on this! we love the fact that the pieces are a bit more chunky!